After renting a 4×4 truck in Antofagasta, we’ve spent the last week camping and touring in the Atacama desert, based around the oasis town of San Pedro de Atacama. Read more about our adventures this week, and see LOTS more photos below! Our first stop was the famous Valle de la Luna (Valley of the Moon), an interesting geological area full of strange salt-rock formations. 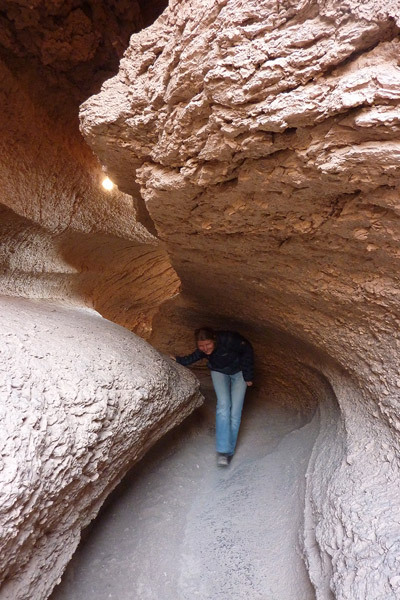 The highlight of our afternoon visit here was a fantastic little hike through a strange slot-canyon-cave-tunnel. The rock here is really interesting – it looks like mud, but it’s really super hard salt-infused rock. We forgot to bring our headlamps on this hike, but pressed ahead in the darkness of the cave anyways using Claudia’s camera light to guide the way. Luckily the cave/tunnel wasn’t too terribly long and we popped out the other end pretty soon. The next day we drove up and up and up above the desert to the Salar de Aguas Calientes, a high lake and salt flat at about 13,000 ft. elevation with a series of hot springs along the edge (not great for bathing, unfortunately, due to lots of green muck and bitterly cold winds). 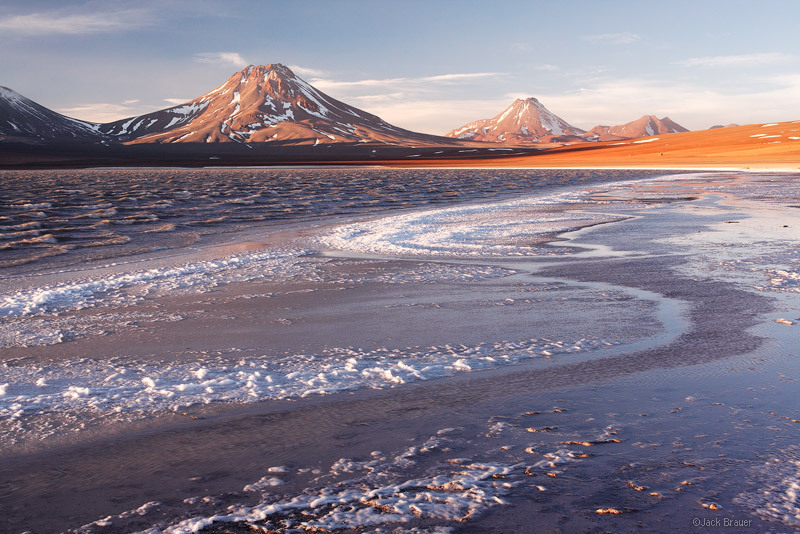 The water in the salar is an amazing turquoise color, with surreal barren mountains rising above – a photographer’s paradise! I took many many photos around here; I’ll post more once I’m home in January. (In fact, I’m not posting most of my best shots yet because it’s too difficult and time consuming to process them on my little laptop screen). At this high elevation, it was super windy and terribly cold – in fact it even snowed a bit and the entire salty lake froze over during the night. Fortunately we found a pretty good shelter from the wind beneath a leeward-facing cliff. There’s me in our caveman kitchen, hiding from the wind. Next, we headed to Laguna Lejia, another high remote lake accessed via a series of rough, high passes. 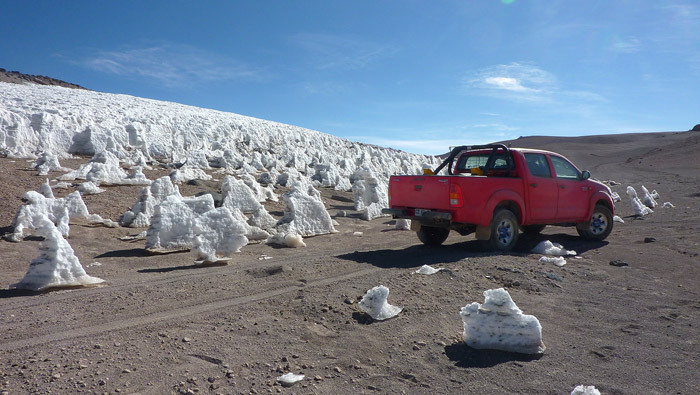 Here’s our HiLux truck amongst some penitentes at around the 15,000-foot mark. Volcán Simba o Aguas Calientes (5831m / 19131 ft.) and Cerro Acamarachi o Pili (6045m / 19833 ft.) as seen at sunset from Laguna Lejia, Chile. 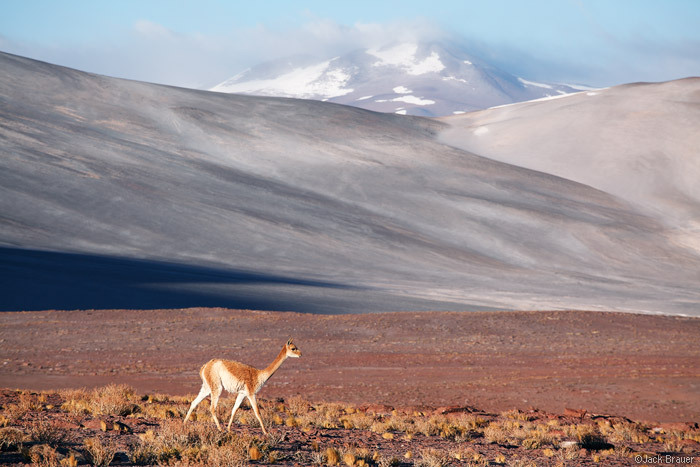 One of the most interesting things about the Andes around the Atacama is the sheer number of volcanoes – they’re lined up one after another as far as the eye can see. Laguna Lejia is situated in a particularly nice spot to view a number of these volcanoes, and I was stoked to catch a nice sunset and sunrise during our brief stay there. This lake is at a lofty height of 4500m (almost 14,800 ft.) elevation, and was even colder and windier than the night before! Even worse, there was no shelter whatsoever, so we decided that our only choice was to sleep in the truck. Sleeping in a car is usually a sign of desperation, but this actually turned out quite nice – the truck was warmer than the tent and the fully reclined seats were surprisingly comfortable! Though we had wanted to hike up Vulcan Lascar, it was simply too windy and cold to even think about attempting that! One night at Laguna Lejia was enough suffering for us, so we headed back down to the town of San Pedro de Atacama for a nice dinner and a real bed for a change. 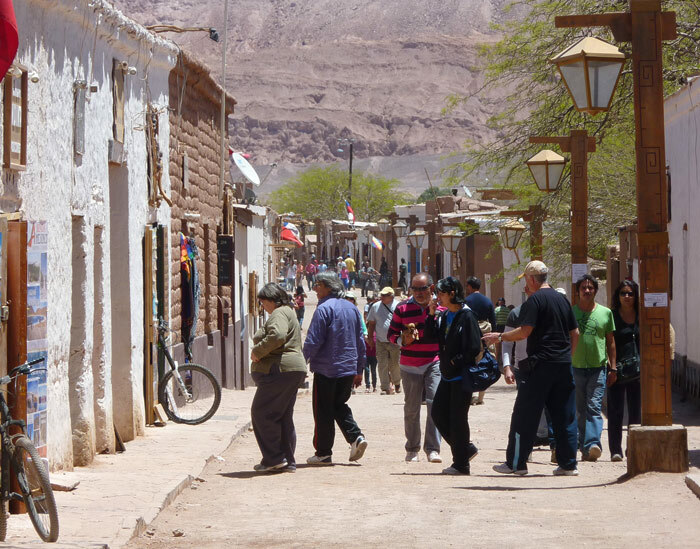 The adobe town of San Pedro de Atacama is super touristy, but easily seduced us with its lazy relaxed atmosphere and tasty food options. We ended up staying for a couple nights so that we could have more time to chill out and soak in the atmosphere of this cozy desert town. The next day, we heard a report that the wind was dying down. That was great news, since we were thinking that it was just always totally windy around here. So in the afternoon we spontaneously decided to go for a hike up Cerro Toco, which is regarded as a “novice” hike around here, even though it rises to 18,504 ft.! Well, it was actually a pretty easy hike, especially since we were able to drive up to 16,400 ft.! 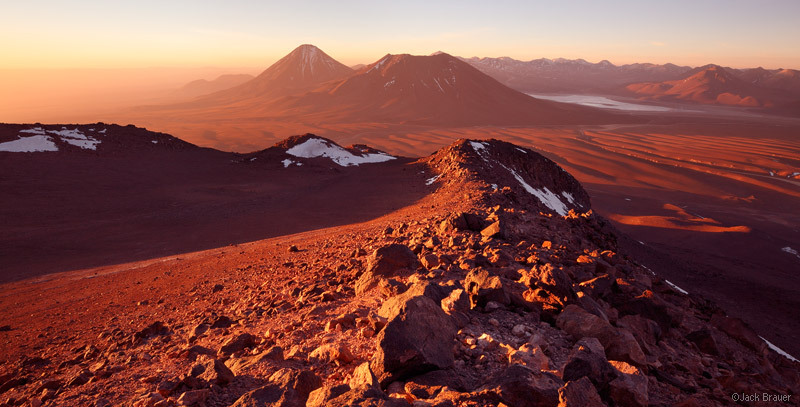 Sunset from the 18,504 ft. summit of Cerro Toco, high above the Atacama desert in northern Chile. Of course, being the nutjob photographer that I am, I had to stay up on the summit for sunset! Well, although I was getting a bit chilly by then, it was worth it. I made it back down to the truck by dusk, and we were back in town by dinnertime! 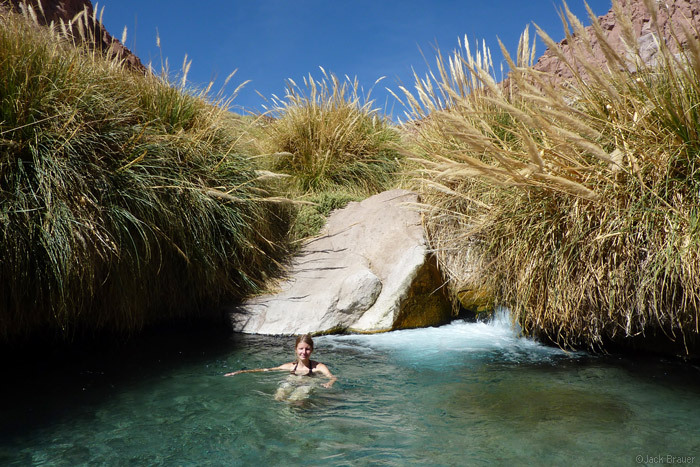 A short drive from San Pedro are the Termas de Puritama, a hot spring river set in a deep canyon in the middle of the driest desert in the world. There’s a series of eight or so pools with clear hot water flowing through them all. A true oasis paradise! This was one of the most amazing and memorable hot springs I’ve ever visited, and we stayed there for hours until they finally kicked us out at closing time. Definite a highlight of the trip so far! That evening we camped again in our favorite spot just outside of town – the Valle de la Muerte. A canyon winds its way through surreal eroded formations until you get to a martian landscape of sand dunes amongst more eerie salt-rock formations. Why not hang out in San Pedro some more? 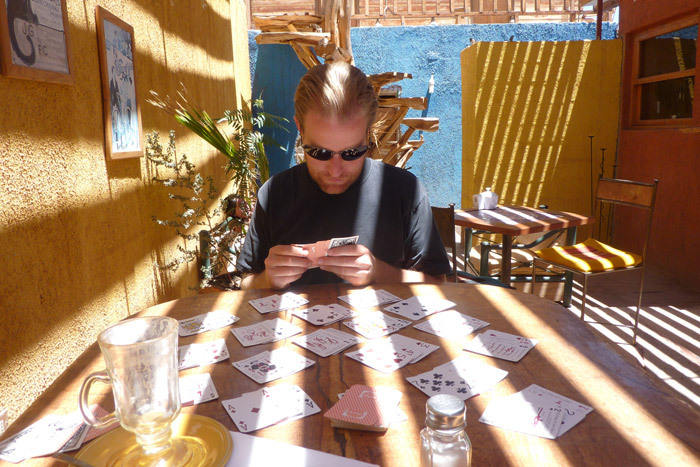 Here I am playing our favorite game – Rummikub. 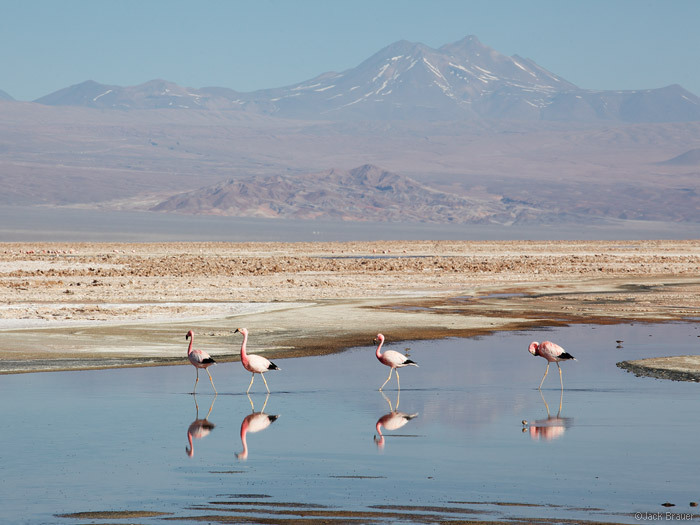 Our next stop: Laguna Chaxa, in Los Flamencos National Reserve, in the center of the Salar de Atacama, the huge salt flat south of town. Three species of flamingos live here year-round. 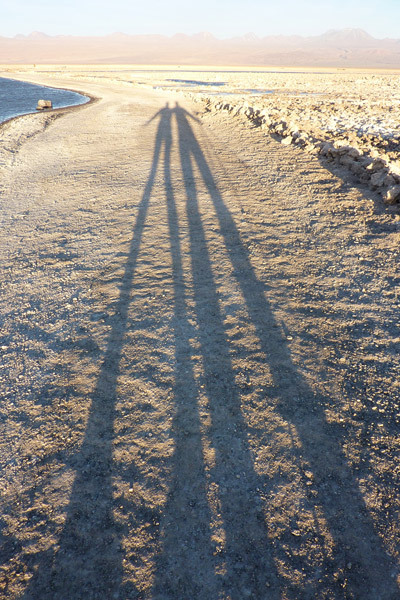 A self portrait of Claudia and I at Laguna Chaxa. We’re tall people. Oh my gosh, where did that beard come from?! Well, Claudia likes it, that’s all that matters. 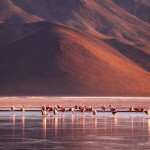 We stayed at Laguna Chaxa until sunset, scoring some unexpectedly fantastic sunset and dusk photos there. Another night camping at Valle de la Muerte, and now we’re hanging out again in San Pedro de Atacama, where I’m typing this from. Soon we’ll get back in the truck and head north to the town of Pica, which has dunes, natural pools, and more wine! Stay tuned! Excellent! Some really beautiful places there Jack. Thank you guys. The photo of the two of you on the rocks, “priceless”. Damn, that looks like fun Jack! Amazingly beautiful country, and I can’t wait to see your favorites. The hot springs look fantastic, and the beard’s lookin’ sharp too! I’m happy to follow your adventures once again. nice shots…it looks like an awesome landscape. We’ll have to schedule it in on our trip! Hi Jack, great to read about your adventures – you’re a great storyteller both visually and verbally! They remind me of my 9 months of traveling around Patagonia a couple years ago. One question, how do you get around, by taking buses, hitchhiking, or rental car? Whose Toyota Hilux truck was that by the penitentes? I found it was remote and desolate at times, and ended up buying a car to live out of; how are you managing? Thanks Johnathan! Mostly on this trip we’ve been taking buses. When we went to the north and back we took overnight buses, which are pretty cool – you can sleep a bit and not have to waste money on a layover hostel. During our 3 weeks in northern Chile we rented the 4×4 HiLux. It was way too expensive, but I think the only way to do it in such remote areas, aside from joining tour groups, which is not really our thing, and would have been nearly as expensive anyhow. Otherwise, buses. I sometimes miss the freedom of a car, and certainly you miss many or most of the roadside photo opportunities, but I’m not much into roadside shooting anyways. And with buses, we don’t have anything to worry about (parking, theft, gas costs, etc). Having the truck in the north was a bit of a headache in those regards. 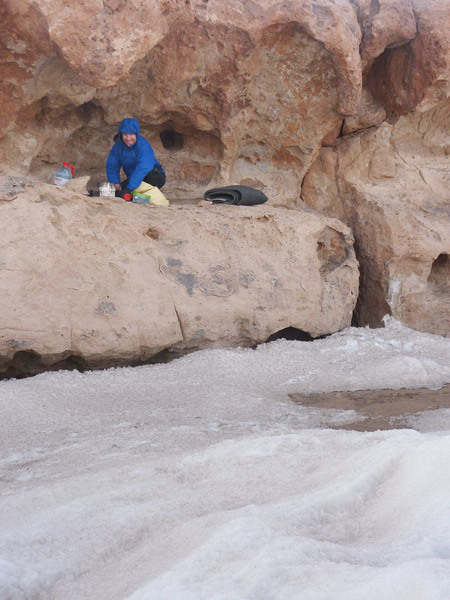 By the way I wonder where did you camp in valle de la luna? aint it a monitored park? i ask you cause im visiting San Pedro next year and im curius of the spots where you camped . Also did you use any ND filter for your shots? Hi Jack. Thanks for posting the pics (beautiful) and text (helpful). 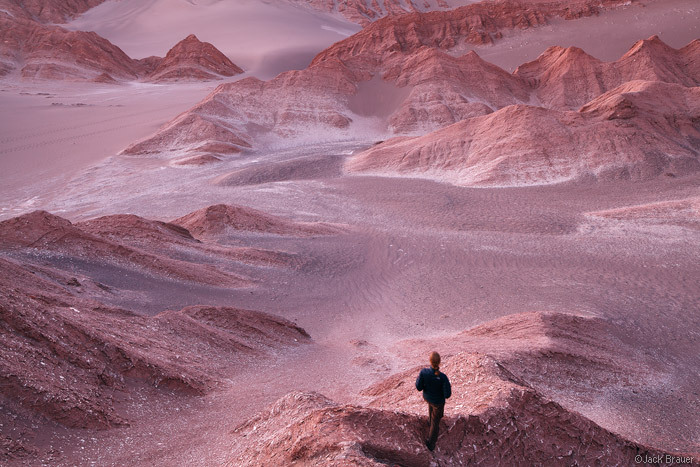 I’ll be in San Pedro de Atacama in March 2015 and wonder if you can give any direction for reaching the spots you photographed in Valle de la Luna, the slot canyon/cave, and in Valle de la Muerte? 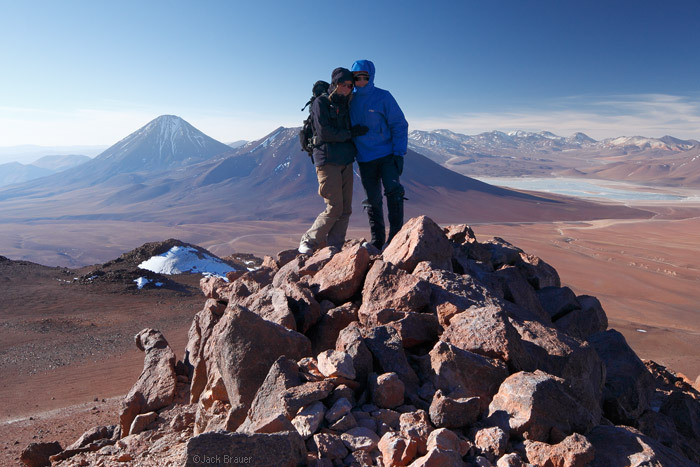 Which time exactly did you travel to Atacama desert? Where did you get the maps from to get to those places? Looks great! 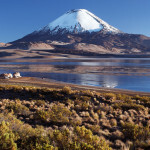 My wife and I wanted to camp all around atacama as well, but could not find that many official campgrounds. Where did you wind up camping each night? Hi Igor, we mostly just camped in random spots most of the time. We had troubles with the wind and cold, which made sleeping in the tent somewhat miserable and occasionally impossible. Would have been much easier if our truck had a camper shell on the back! 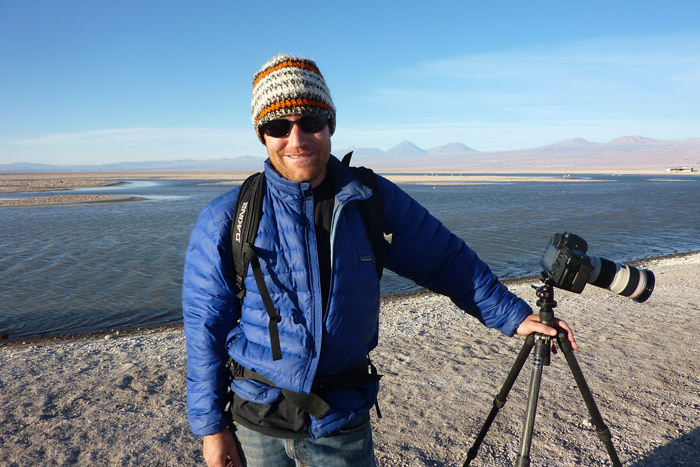 Thanks for this post (and your other Atacama posts). 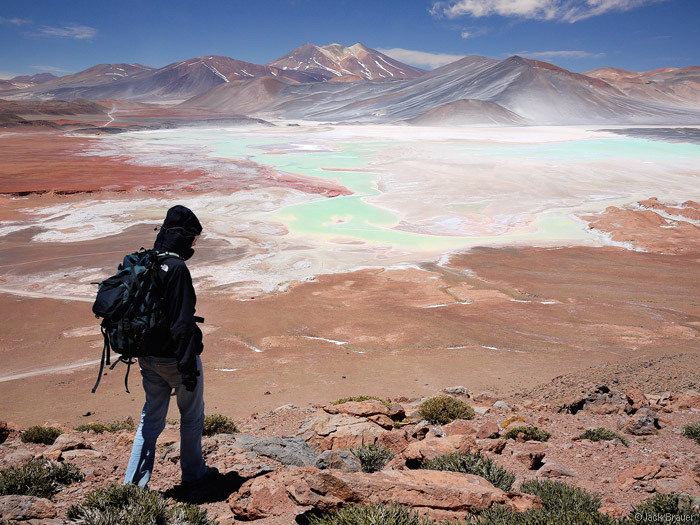 I’m heading to the Atacama in June/July, hoping to camp out in the Valle de la Luna or Valle del Muerte for at least a couple of nights if possible. Do you remember if these places were far enough from San Pedro to get decent star shots without too much light-pollution? Hi Stu, I’d say that the Atacama region has probably some of the darkest skies in the world, if I had to guess. There’s just really not much around there to cause light pollution; plus there’s the high altitudes with less atmosphere. San Pedro itself is a pretty small town, so not much light there either. In fact there’s some big astronomy stations in the mountains near there for that very reason. That said, if you have time to drive up to some of the higher plateaus such as Salar de Aguas Calientes, you’ll probably get even darker and clearer skies. Thank for replying. I won’t be driving, only hiking (and possibly cycling), so it is good to know there are some sites within reach of the town. Thanks again. 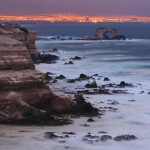 Was it ok to self drive to all those places in Atacama Desert? We are planning to rent a car in Calama, but we are afraid of not being able to go to the main atractions. Would you recomend it? Hi Lara, yes we had a rental truck (a Toyota HiLux 4×4) and were able to see all the places you can see in my photos ourselves. Some of the roads were pretty rugged but doable with a 4×4 like this. With a car you could probably see much of these places as well, but some of the roads would be too rugged; I think a truck would be a safer option. I do think a rental is important; it would be very difficult or impossible to see most places there with public transport. Or I suppose you could join some kind of guided tour group as well. Have fun! Where did you end up camping in Valle de las Muerte? I’m finding a hard time finding rad places to camp! 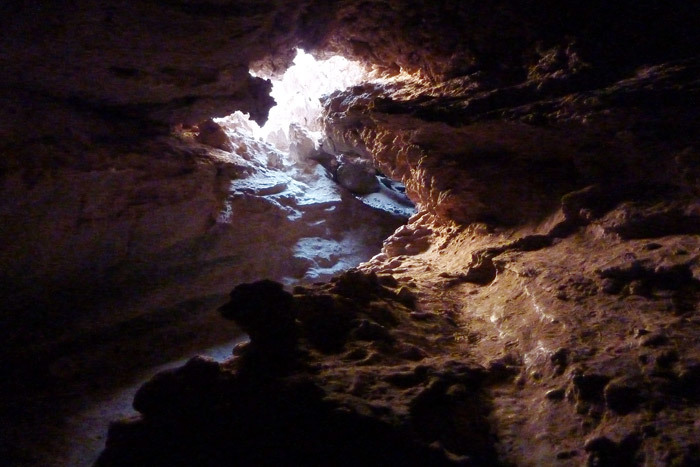 These are excellent pictures, I planned several of my own excursions in the Atacama (like to the Salar de Tara and Laguna Aguas Calientes) based on your write-up, thank you! I’ve posted a few pictures of my own from the trip if you have any pointers, hopefully they will also rekindle your memory of the place! hi Jack, My family and I are headed to Chile for 2 weeks over Christmas. 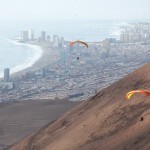 4 days in Atacama. Your post just got me so excited! 1) How’d you handle the elevation? 18k mountain is high enough for altitude sickness. Had you been at elevation for a while? 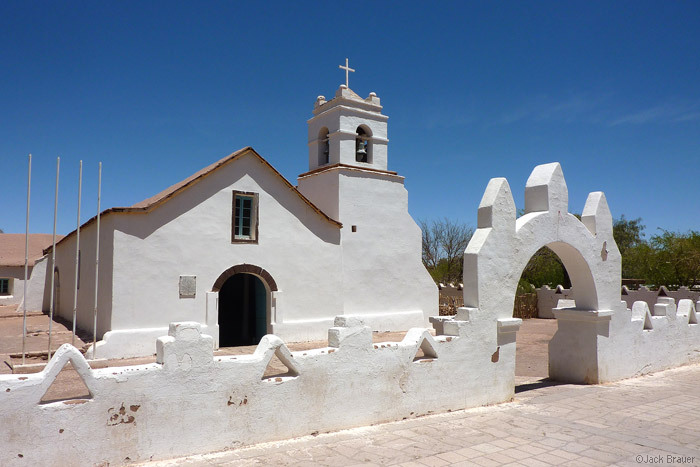 2) If you had 3 full days and were centered in San Pedro de Atacama, what would you prioritize? 3) Given that priority, is a 4×4 required?